20th Century Fox released the full length trailer for Ridley Scott's "Exodus: God and Kings" on Wednesday, revealing Christian Bale in the powerful role of Moses. The brand new sneak peek is set to Coldplay's "Midnight" and introduces the story with the tagline: "When men ruled as Gods, one was chosen to change the world." Moses, portrayed by Bale, is seen growing up alongside Pharaoh Ramses, played by Joel Egerton, before their lives take very different turns. The film, inspired by the Bible, also stars Sigourney Weaver, Ben Kingsley, "Breaking Bad" star Aaron Paul, Ben Mendelsohn and John Turturro. "The year of your birth there was a prophecy that our leader would be born to liberate us, that leader is you," a slave tells Moses. "After 400 years of slavery, things here have become much worse. As your brother you must set them free." In the trailer, clouds of locusts as well as darkness, hail, and other disasters rain down on Egypt before total war unleashes between Moses and Ramses. "I came to tell you something is coming that is far beyond you and I, this is about Egypt's survival do you understand," Moses declares. 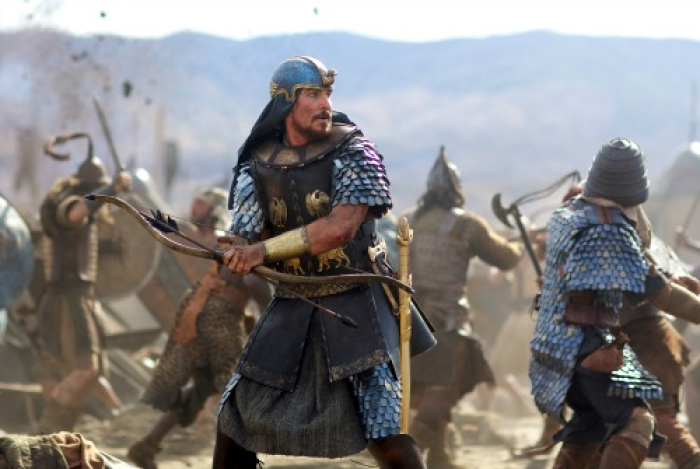 "Exodus: Gods and Kings" is slated to hit theaters Dec. 12. The over three-minute trailer from the "Gladiator" director has received mixed reviews online, with some moviegoers excited about the Biblical story reaching the big screen, while others feel the adaptation will fall flat. "The first official trailer for 'Exodus: Gods and Men' has arrived and it looks bonkers," Entertainment IE wrote on Twitter on Wednesday, Oct. 1. The Dissolve added, "Prepare to be plagued by the latest trailer for Ridley Scott's Exodus: Gods and Kings." Alternately, Twitter user Jefferson posted, "The new trailer for 'Exodus: God & Kings' got released today. It looks EPIC. Who's going to see it? I know I am!" MTV News wrote, "The bible goes bad___ in the new 'Exodus: Gods and Kings" trailer." "Gladiator meets Ten Commandments? I'll party," Joseph added.